This page follows Hang gliding 1975. Kimmeridge is a south-west facing ridge a little way inland from the sea shore in the Purbeck region of Dorset in England. Nowadays we fly the nearby south-west facing hill and sea cliffs at Ringstead, but in 1975 Kimmeridge was the principal south-west site in this part of England. It is still flown (2010) but mainly by paragliders. 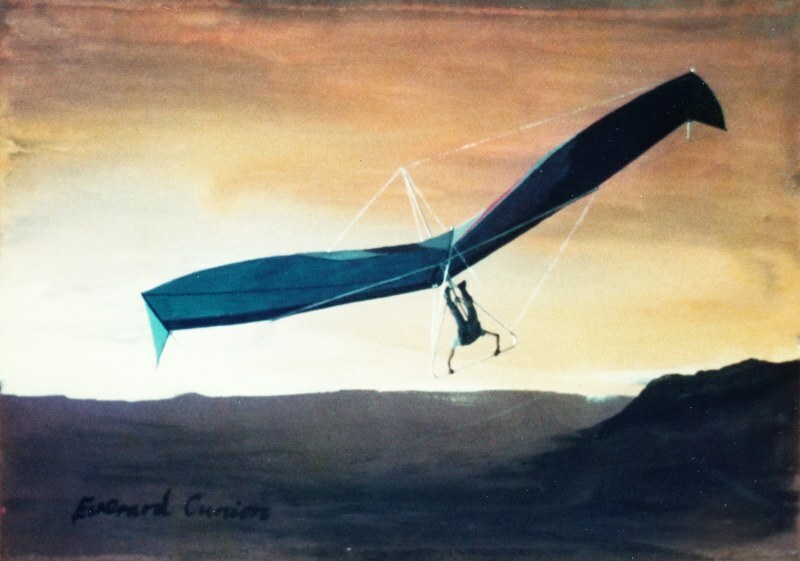 Rob Stokes flies the Icarus V rigid hang glider in 1976. Photo by Dave Lewis. 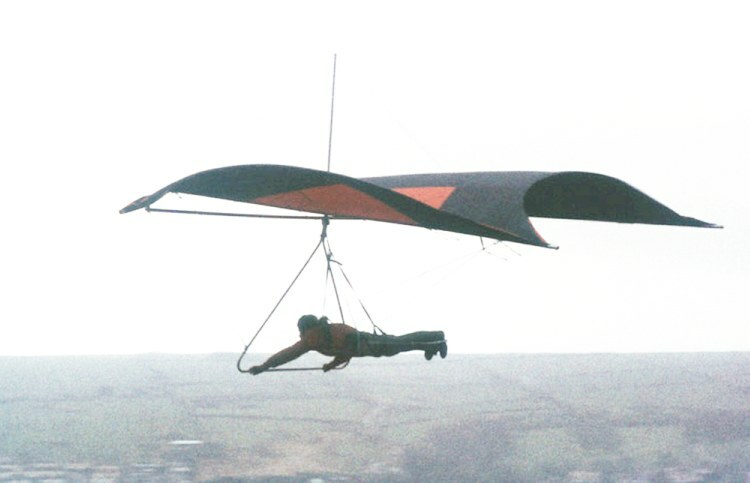 In these photos by Dave Lewis, Rob Stokes flies the Icarus V rigid hang glider in 1976. Twist grips on the hang cage armrests operated the tip rudders. For more photos taken at this once popular site, most taken in 2010 (and of poor quality) see Kimmeridge Khmer Rouge (a sub-page of Hang gliding 2010). See Devils Dyke Brighton Hang Glider Icarus 5 for a flickr slide show of Don Liddard’s photos taken in 1978. The Manta Fledgling was built more like a flex-wing than the Icarus V, but it was nevertheless a rigid type that relied on drag rudders mounted at the wing tips for turn control. 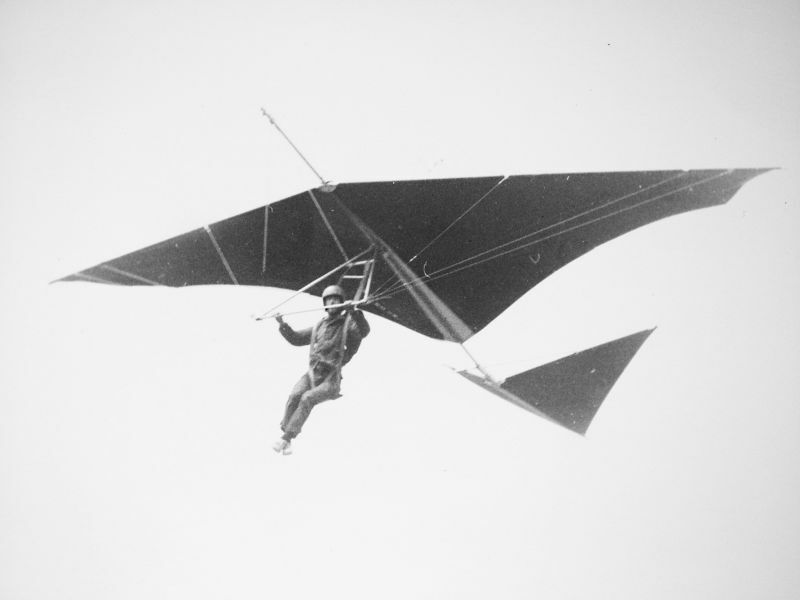 Rigid hang gliders provided more performance than flex-wings, but at the cost of greater complexity. Mean Machine 1 was the first of three swallowtails built by Martin Orr. It is flown here by Chris Scoble. (Chris invented the ScoboJet paraglider power unit of the early 1990s.) Note the scallop and reduced billow compared to a standard Rogallo. Mean Machine 1. Photo by Dave Lewis. The prone harness imparted a dramatic increase in performance and pitch control. Photo by Dave Lewis. The prone harness imparted a dramatic increase in performance and pitch control. That combined advantage greatly improved our ability to soar. Because your angle of bank in a coordinated turn is limited by the positive (nose-up) pitch rate you can achieve, and the seated flying position conferred very little pitch range, we could only fly shallow turns without the turn degenerating into an inefficient spiral descent. The prone flying position enables the pilot to ‘push out’ and thereby coordinate a steeper banked and tighter turn. That was important for flying in thermals, which we began to do (unwittingly at first) in the long dry summer of 1976 in southern England. 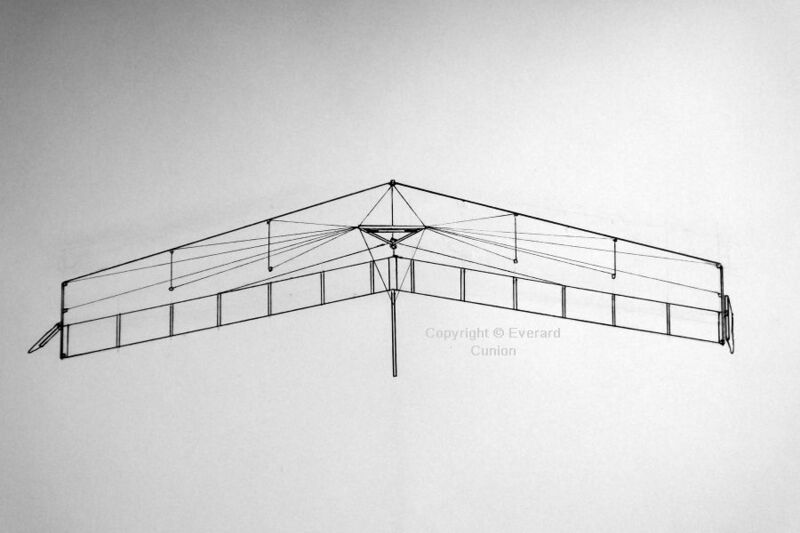 As far as I know, Hiway Hang Gliders of Brighton in Sussex were the first in Britain to manufacture prone harnesses. The glider in this photo by Dave Lewis is a Hiway standard Rogallo. In 1976 I was a hang gliding instructor, first teaching beginners informally at my local site, then working for a hang gliding school in south Wales. One day teaching beginners on a low slope, we found that those who flew one particular glider (the sole example of the type that we used) kept nosing in hard shortly after launching. We determined the correlation with the incidents and the specific glider only gradually. Why did Fred Bloggs nose in just now when he was OK two minutes ago. And why has Joe Soap just nosed in? Eventually one young fellow, a student at the nearby Polytechnic of Wales, was winded so badly in a hard impact he was unable to breathe. He just lay on the ground curled in a ball for a minute. I thought we were witnessing a fatality. However, in a few minutes he was up and about and able to describe his experience. My relief was short lived. “Everard, take that glider up and find out what’s wrong with it.” The chief instructor was a former RAF pilot, glider pilot, and scuba diver. I launched with plenty of speed (for safety) and was settling into the short period of level flight afforded by the low grass-covered slope when the glider slowly, but unstoppably, pitched nose-down and gathered speed, in much the same way as in stall recovery, but I was nowhere near the stall. I ‘pushed out’ on the control bar for maximum rearward weight shift (equivalent to hauling back on the control stick in a conventional glider or airplane) and it levelled out and flew normally from then on until I landed (for a total flight time of no more than thirty seconds). “That glider is grounded,” said the chief instructor. No explanation from me was needed; everyone saw what I did and what the glider did. The 1976 Wasp Nova was another attempt at attaining more performance without too much extra complexity. It featured an S-curved keel tube and tip fins braced by tubes, brackets, fasteners, and cables. Most of the Cobra pilots seemed to be about eighteen years old, with all the fearlessness and the belief in their own immortality of that age group. Most of them had the judgement of a load of bricks. This design suffered from an unfortunate pitch characteristic that aerodynamicists term phugoid motion. The camber curve of the sail changed shape as the angle of attack changed, which amplified my pitch control inputs—after a brief delay. On one test flight, that positive feedback mechanism sent me into a series of pitch oscillations. Fortunately, it happened to be leveling out from a dive when I touched down in the dusty bottom field at Monk’s Down. I contracted out the construction of my sails to a local hang glider sailmaker (who, at age 17, had built his own Skyhook IIIA from plans) but I built the airframes myself. My hang gliders all flew — eventually. However, I was always at least two steps behind the state of the art. Notice the absence of an emergency parachute at this time. I took this photo of Winklebury hill from the car park at Berwick St John village fête in June, 2013. The aspect reminds me of a trivial event in early 1976, when this was our only north-west site. (Bell Hill had not yet been discovered.) I was at the farm at the bottom, watching one of two flying brothers on approach to the landing field (nearer the hill than where this photo was taken). Flying seated in a Waspair Falcon IV, framed by the hill and some low trees (out of view in the photo) he went right round in a 360-degree turn with little loss in height. He then levelled out and landed normally. That was the first 360-degree turn in a hang glider I had seen. Doesn’t sound like much, but it was most impressive for those times. However, the pace of advancement was so rapid that, by the end of that summer, 360 degree turns were considered almost routine.